If you've ever wanted to enter a world of combat, intrigue and betrayal, the newly announced Song of Fire and Ice game might be just what you're looking for. The Song of Fire and Ice books by George R.R. Martin depict the bitter battles between the houses of Westeros, and the shifting, and often brutal, fortunes of their members. The series has sold more than 7 million books worldwide, the first of which is currently being adapted into an HBO miniseries. 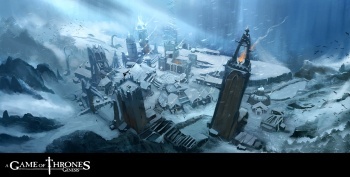 And now you can add a videogame to that list, following the announcement of A Game of Thrones: Genesis, a new real-time PC strategy game from Cyanide Studios, which will allow fans to pit mind and muscle against the likes of the Lannisters and the Starks in the conflicts depicted in the books. There will be multiple paths to victory, and players will be able to take territory a number of different methods, send spies and assassins to neighbors, capture officers from other families and more. Developer Cyanide says that trickery, treachery and deceit are widespread however, so don't be surprised if someone tries to do the same thing to you. It sounds like the game will have some more turn-based elements as well as the real time stuff, which should make it pretty interesting to play. There's no release date set for A Game of Thrones: Genesis beyond some time in 2011. Cyanide is also working on a Song of Fire and Ice RPG, but at the moment there are even fewer details available for that.